Family squabbles have a way of turning ugly in a matter of seconds, and yet can be weirdly comical to a bystander. Relatives know too much about each other and have too wide a range of weaponry to choose from. When a burned dinner from ten years before can suddenly surface as a major accusation, it's safe to say that all bets are off and we enter the realm of the absurd. 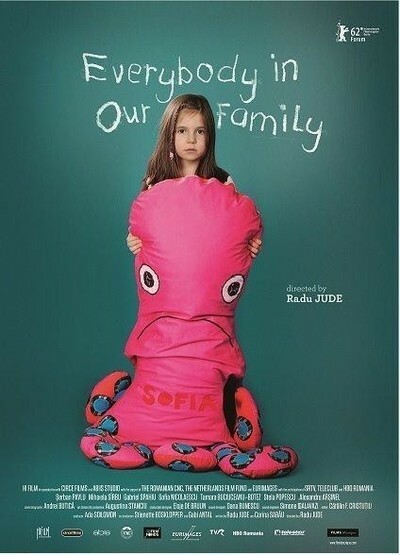 "Everybody in Our Family," a new film by Romanian director Radu Jude, is a violent, funny and disconcerting vision of a familial argument turned into actual slugfest. What makes the movie compelling is that even though the characters act in extreme ways, the whole thing doesn't seem exaggerated in the least. Marius (Serban Pavlu), a thirty-something divorced dentist, plans to take his small daughter Sofia (Sofia Nicolaescu) to the seaside. The girl lives with Marius' ex-wife Otilia (Mihaela Sirbu) and her new partner Aurel (Gabriel Spahiu). When Marius arrives and announces it's time for the long-planned camping trip, his former mother-in-law, Coca (Tamara Buciuceanu-Botez), informs him that the girl was sick just the day before and that the trip may be not such a great idea. Aurel seconds her, even though Sofia seems fine. Marius doesn't take no for an answer, and since his ex-wife is still at the beautician's, he decides to simply take his daughter and leave. A fight with Aurel ensues and once Otilia joins the party, things get really nasty. Even though the elderly Coca tries to placate him, Marius goes off his rocker in a spectacular fashion. He bangs Aurel over the head with a frying pan, gags him and ties him up — just for starters. The film turns into an epic fulfillment of every Ralph Kramden-like threat of what will happen "one of these days" if a man is pushed to his limit. Old wounds are opened and no can of worms is left untouched. By the time Marius and Otilia are exchanging startlingly vulgar barbs (all the more jarring in mouths of folks priding themselves on their education), there is a delirious feeling in the air. We laugh — mainly because there's barely any malice in the picture, just a gargantuan failure of communication. Movies that tackle explosive conflicts set in confined spaces usually originate as stage plays and can be burdened by glib wordiness. Even such pressure-cooker classics like "Who's Afraid of Virginia Woolf?" (or the more recent "Carnage") ultimately feel like elegant contraptions for actors to exercise their chops. "Everybody in Our Family," on the other hand, is much more raw: the dialogue is seemingly messy and unpredictable, editing is choppy, and the whole situation feels as banal, silly and horrifying as only an actual altercation can be. What makes the movie work is the consistent, comical self-pity of Marius, who at one point even professes mad love for Otilia and says they should get back together again. It's a great moment for the actress Mihaela Sirbu, who manages to convey that tiny glimmer of amusement still dancing inside her, letting us know that Marius and Otilia were probably a great couple long ago. In this moment, the film plays almost like a kitchen-sink version of "His Girl Friday," with madcap Marius trying to save Otilia from a lifetime of boredom with Aurel the fuddy-duddy. He even quotes poetry to her and her expression makes it clear that no one has done it in a long, long time. Not as extreme as Cristi Puiu's "Aurora," which waited about two hours before allowing the events to coalesce into some sort of a plot, Jude's film nevertheless takes its time setting up its centerpiece. The first half is constructed almost entirely of small non-events, which is in accordance with the recent trend in New Romanian Cinema, of which Puiu is the patron saint — a fascinating and much-awarded string of films that redefine screen realism in their dedication to process, duration and detail. The last shot of the movie is great in an unobtrusive way that made me think of the closing scene of one of my favorite films of recent years, "The Kid with a Bike." The main character, bleeding and shaken — but already going back to old habits, as indicated by the cigarette he lights up — simply walks away from the camera and down a busy street. We've witnessed the violent turmoil he experienced (and caused), but we're forced to let go of him just as his nerves start to settle down. What Jude suggests is that Marius is a volatile man of passion who would better fit into another period in history. Had he lived in medieval times, he would be that guy who burns down three villages to get a girl's attention, or starts a war over a misplaced token of affection. Jude doesn't make us admire him, but he leaves us no choice but to acknowledge how much life there is in the guy.